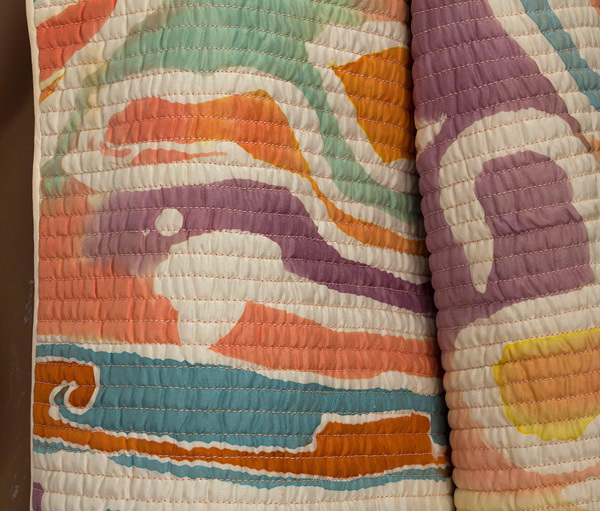 Mary McFadden is sometimes described as a "design archaeologist." Her years of world travel formed her fashion vocabulary, which shows the influence of Egyptian, Greek, Celtic, Byzantine, Pre-Columbian, Indian, and African cultures. While working at Vogue, she was encouraged by the editors to start her own design line. She was quickly picked up by the innovative store Henri Bendel, which featured her batik coats and quilted fencing jackets. 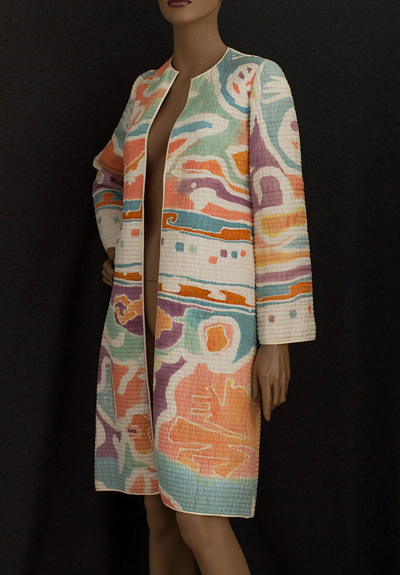 This dreamy pastel evening coat is printed with a watered silk, abstract design on an ivory ground. The lining is pale lilac silk. 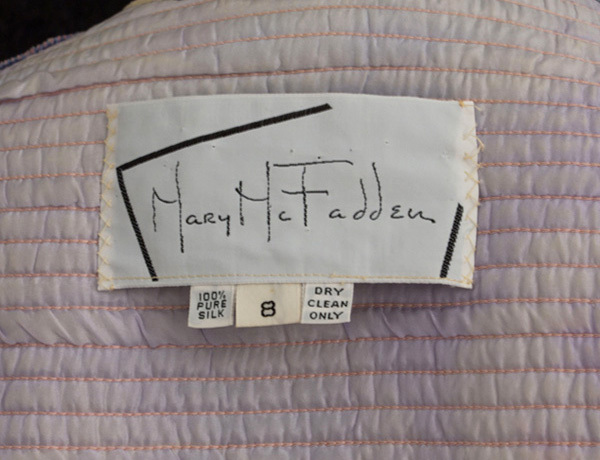 The labeled coat features McFadden's line quilting. 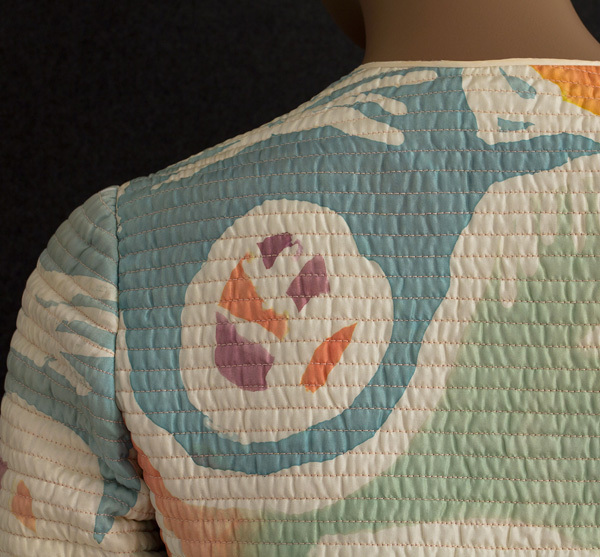 This decorative coat is lightweight and easy to wear; and it hangs perfectly. The cardigan style does not have a closure. 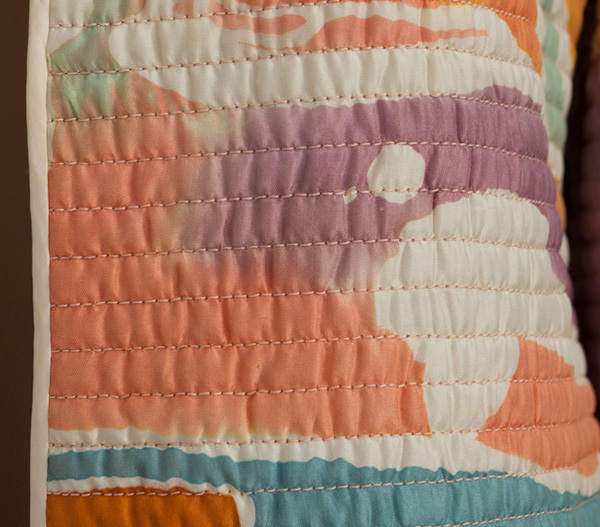 The edges are finished with self binding. 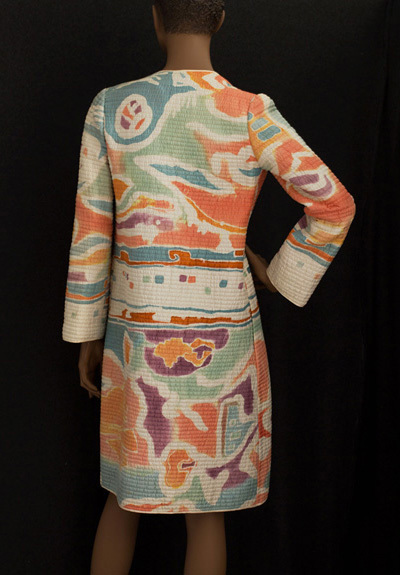 In McFadden's fashion, we often see what is apparent in this coat of many colors. It is joyous, fresh, and natural. This may derive, not only from her costume art, but also from life experience: as a young girl, she lived on a cotton plantation in Tennessee. There is always room in the fashionable wardrobe for a smart coat that can be worn with simple black pants. The stylish coat would also be spectacular over a simple slip dress. 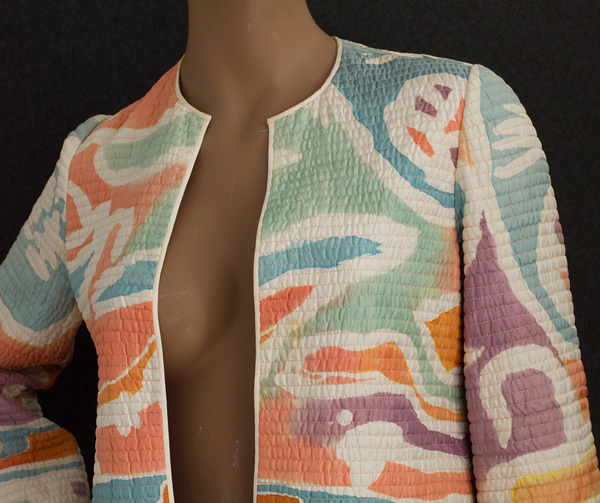 Even before the time of the biblical Joseph, a multi-colored coat signified leadership. In the case of McFadden's charming creation, the many-hued design tells us the wearer belongs to the aristocracy of style, whose smart attire always attracts admiring glances. The size is marked 8. It measures: 36" bust and waist, 38" hip, 14" from shoulder seam to shoulder seam, 23" sleeve length, and 40" from shoulder to hem.